One of the biggest gripes I have about my own photography is the presence of harsh shadows when I use a flash. The shadows can be unsightly and draw attention away from the rest of the photo. Below are two cases; one in which a harsh shadow is extremely prominent and a second case where it is not. I benefitted from some nice diffuse light in the morning hours in which the bottom photo was taken. This light coupled with a flash from my Speedlite 430EX II created a nicely lit photo, but harsh shadows still exist near the feet. The top photo is absolutely terrible in my opinion, as the harsh shadow is extremely prominent and takes away from the rest of the shot. The problem with light from a single flash unit is that even when shot with a small diffuser, it is extremely direct and is going to hit the photo subject straight on and cast shadows. There are several measures that can be taken to combat this problem. Companies like Canon and Nikon make different flash systems which allow light to be fired from multiple points, such as Canon's MT-24 EX Macro Twin Flash. This adjustable flash system allows for lighting from different locations and angles and helps reduce shadows and makes for a nicely lit photograph. Nikon sells a similar model, which is wireless. Ring flash options such as the Canon MR-14EX Ring Flash create the same affect and offer better overall lighting. The one major setback to these flash systems is that they carry a heavy pricetag, ranging from $599.00 to $750.00. Instead of ditching my entire flash system, I decided to go along a different route. 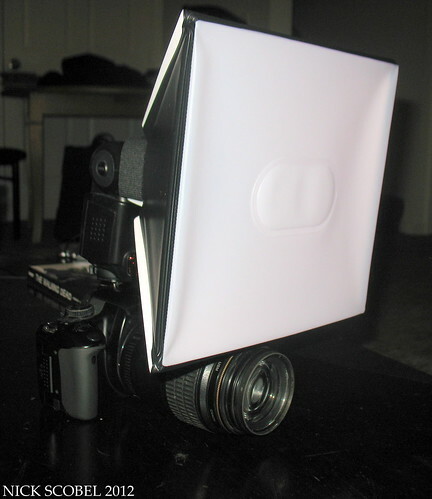 This is a softbox flash diffuser made by Lumiquest. 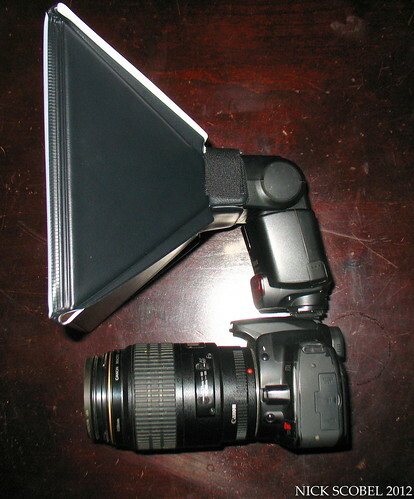 It features a 7"x9" surface which emits soft, diffused light over an area twenty-five times the size of the flash head itself, thus greatly reducing shadows and creating a nicely lit photograph. I've fired a few test shots with it and am really happy with the results so far, I just need to photograph some herps with it. It does seem to cause a loss of around 2 stops when in use, which is easily correctable using the controls on the Speedlite. I'm excited to see the results in the field come springtime and see if I can get photos out of it like this one. This is one of the best photos I've ever taken in my opinion.The animal is in-situ and never moved a muscle and the lighting came out perfectly. I can only hope I can get some similar results once winter lets go of Michigan. It aint over 'til its over! November usually signals the end of herp season here in Michigan, as temps begin to dip below freezing and everything retreats below ground. 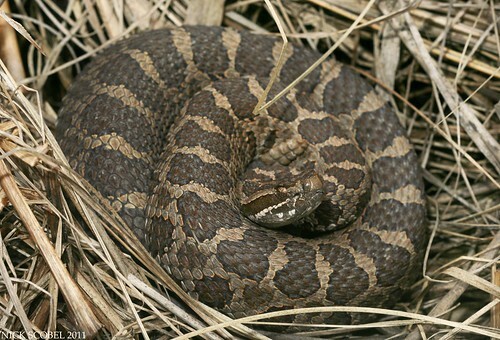 In fact, the latest I've seen any sort of herp active in Michigan is mid-November. 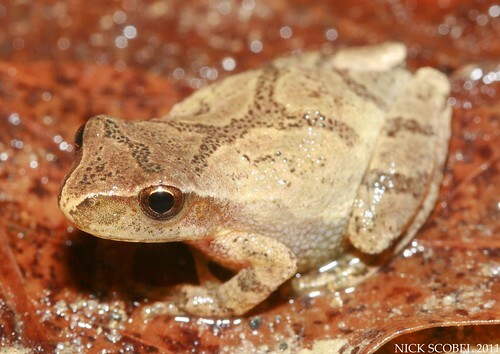 So herp activity in mid-December is completely out of the question right? On the evening of December 14th I got my answer. Temps had been relatively warm for a few days in a row (mid 40s for highs during the day) and there was a large system moving through the Midwest. The system moved right through Michigan and heavy downpours occurred the entire day of the 14th and continued into the night. The high pressure system brought moisture and also higher temperatures as the night went on, my car read 52 degrees Fahrenheit at 10:00 PM amid a heavy downpour. Conditions were perfect, so I loaded up my gear and headed out with my friend Chris to see if we could turn up any confused amphibians. We checked a few vernal pools which still had plenty of ice, so we both decided that driving roads was our best chance to intercept amphibians. Around 9:15 we had our first customer. This was a good sized adult and I was a bit surprised to see this species out. 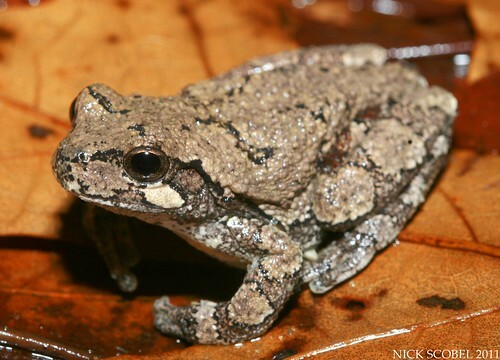 I figured if anything it would have been the smaller frogs like Spring Peepers or Chorus Frogs which would be out, but I was wrong. He was quite alert, but noticeably more sluggish than usual. After a few quick shots, we parted ways. 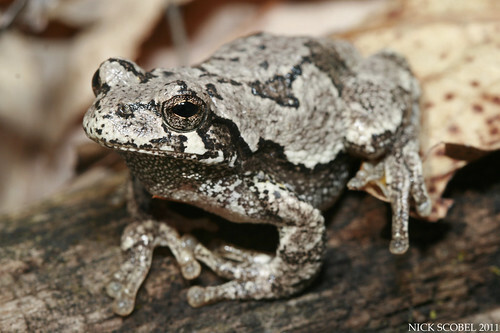 Encouraged by our success, we were elated when we saw several more treefrogs in the next half hour. In the distance, we could hear a few lone Spring Peepers calling and eventually came up on one on the road. 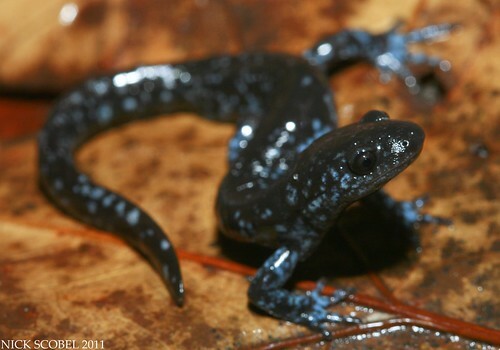 It was clear that the frogs were out, but we were hoping we could luck into a salamander on the move as well. We were in an area which has Tiger Salamanders as well as Blue-spotted Unisexual blobs. At just after 11 PM, Chris spied this little fella on the crawl. It was awesome to see amphibians active this late in the year and I can't think of anytime I've seen or heard of amphibians being active in Michigan in mid-December. This is only further evidence of global climate change, causing an increase in irregular weather patterns at varying times of the year. So in this case, I owe a pat on the back to climate change.